Malaysian-North Korean relations have been imploding since the assassination of Kim Jong Nam in Kuala Lumpur Airport, and the subsequent revelations that North Korea has been doing a whole lot of other shady things on Malaysian soil. If you haven’t already, read my colleague Dan Salisbury’s post about possible North Korean-Malaysian submarine building. 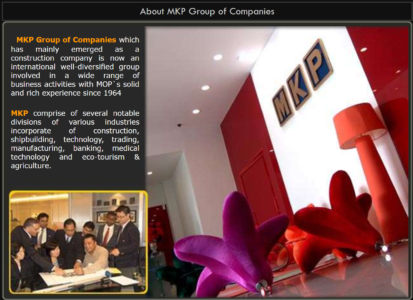 Some of the best investigative journalism around the Malaysian-North Korean bust-up was into a company whose name was familiar to those who follow North Korean networks closely: “MKP” or ‘Malaysia-Korea Partners’. The firm is a joint venture between Han Hun-Il (aka Edward Han), a North Korean who once served in North Korean missions in Africa, and a Malaysian businessman called Yong Kok Yeap. The company purports to be engaged in a range of sectors, from shipbuilding to banking to generic construction. Both the Wall Street Journal and Reuters did some sleuthing into MKP’s activities, and came out with fantastic details on the company and its directors. But in my view, they really missed the best part. MKP has formed another partnership with a South African private security contractor. That company appears to have been, and maybe still is, providing security services to the UN….. The “MOP” referenced above is in fact “Mansudae Overseas Projects”, the North Korean state company which is best known for building awful statues across Africa, though Reuters thinks MKP may have actually been part of the Jang Song Thaek empire. A close look suggests that the man in the top left photo, to the immediate right of the gentleman in the high-vis jacket, is likely Edward Han, MKP’s head honcho. 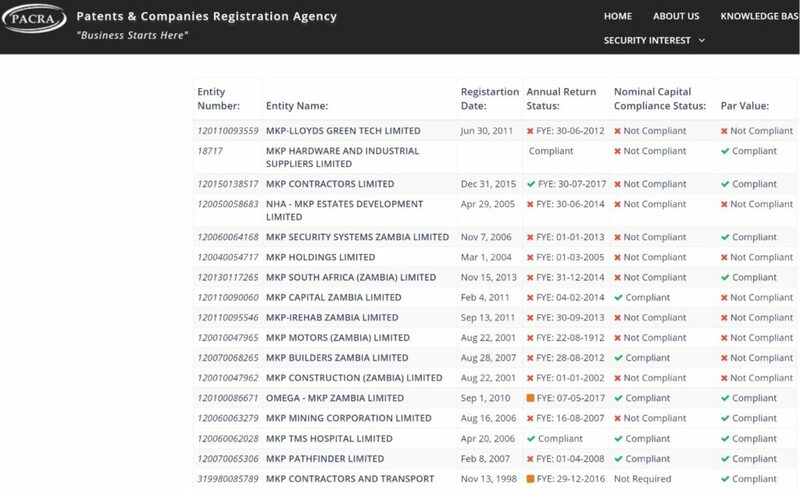 The Zambian corporate registry, which is a nightmare to navigate, tells me that MKP is terrible at filing its paperwork, and that it has a lot going on in Zambia. Mining, hospitals, massive housing projects, banking, private security…. 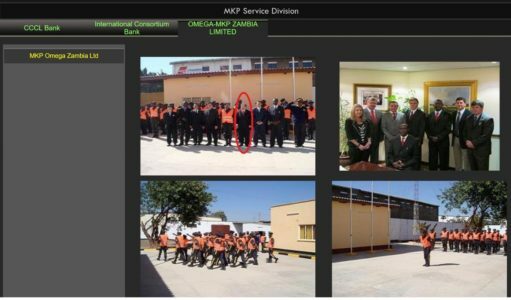 But let’s focus for the moment on the company registered as “Omega-MKP Zambia Ltd”. A quick Google search indicates that the other half of the Omega-MKP partnership is with South Africa-based Omega Risk Solutions. Omega was first registered in 2003, and is run by a group of ex-South African National Defence Forces guys (according to the company’s official profile in the South African registry, which shows no non-South African national directors). Omega Risk Solutions is a private security firm, offering services ranging from training to personal protection, to guard services, to event security, to escorting cash consignments from banks. The company made headlines in 2006 when sixteen of its staff were arrested in the Democratic Republic of the Congo on allegations that they were plotting a coup. 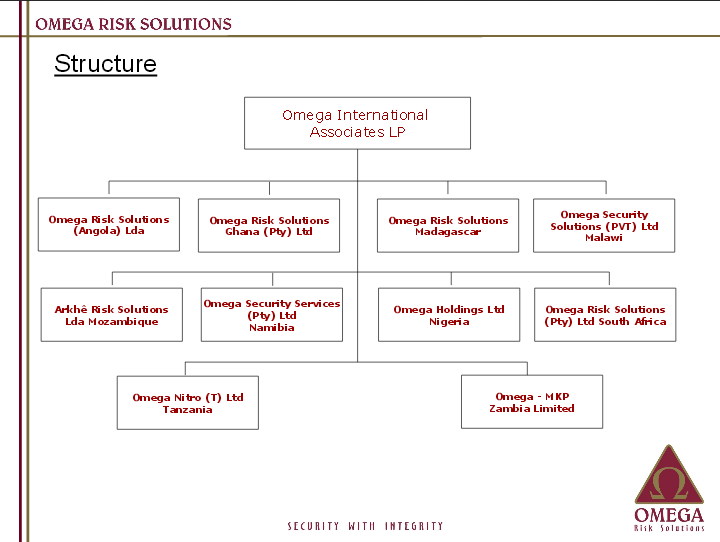 Its main office is in South Africa, but the company at the top of the organization diagram below – Omega International Associates – is actually a limited partnership registered in the UK. From Omega’s own organization chart (courtesy of www.omegasol.com), it is clear that the company has a formal relationship to Omega-MKP. In other words, both the South African (Omega) and DPRK/Malaysian (MKP) ends of this partnership acknowledge that they are in business with the other. Here’s another snapshot from the contact page of the Omega Risk Solutions website, taken on 16 May 2017. 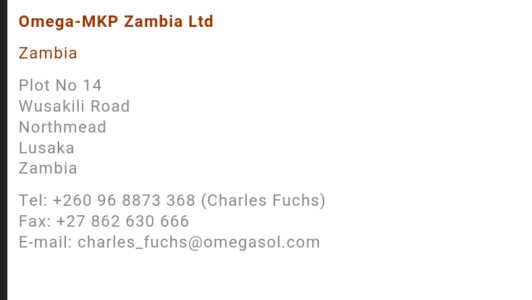 The contact person that Omega publicizes for the Omega-MKP Zambia operation is another ex-SANDF fellow, Charles Fuchs. Charles himself, on his public Facebook page, says he works at Omega MKP. Charles must be a Facebook fan, because Omega-MKP also has a helpful page that offers details of its recent activities. For example, Omega-MKP is hiring (any takers? ), which means we know that they are an active company with ongoing work, something also indicated by the Zambian corporate registry. And a little further down the page, we get this. “Security for the United Nations”. Say what? 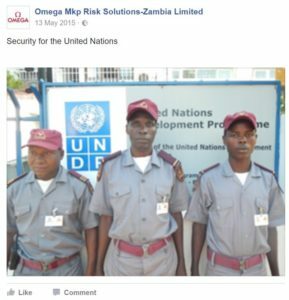 If Omega-MKP is providing security services to the UN, that’s a pretty big deal. Admittedly, Omega-MKP may be simply cross-posting notices of the wider activities of Omega Risk Solutions, and may not itself be the contracting party to the UN. Back in 2008, the Overseas Development Institute identified Omega Risk Solutions as a private security provider to humanitarian operations. Further inquiries are needed to determine what profits MKP derives from the private security partnership with Omega. Under the terms of UN Security Council Resolutions 1874 (2009), States are prohibited from contracting to North Korea for “technical training, advice, services or assistance related to the provision, manufacture, maintenance or use of arms and related materiel”. (Foreign Policy discussed the armament policies of some of Omega’s forces at gem mines in Mozambique recently). Resolutions since 2009 have clarified that that applies, for example, to police training. My guess is that the UN Panel of Experts might read certain types of private security contracting into that prohibition too. It’s just never really come up yet (until now). While it does not appear that North Koreans themselves are doing Omega-MKP’s patrolling, guarding or training, if MKP is a partner in the operation, they are almost certainly profiting from it. And that’s not allowed either.